Music can convey a wide range of expression, indicating the musician's restraint, vigor, or willful abandon. On the anthology Starseed (66'23") the fundamental force here is rhythm, but with serious attention to a lavish textural ornamentation. Equating a sonic action with the measurement of time, the ten tracks, by a range of potent electronic artists, create a body-based music which extends to the far reaches of The Cosmos. Traveling through the miles of circuitry of the brain the works presented on Starseed will fulfil the audience's appetite for the exotic. Its most rapturous passages play out in the head in a hot-wired intensity - our cerebral states enhanced by a potent electronic sound. 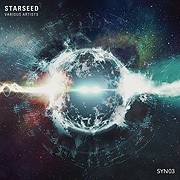 The aural appeal of Starseed never feels slight or superficial. Emotionally direct, it reaches substantial heights. The sensation of a deep throb of powerhouse bass is to feel lilting, airborne freedom. Drum loops stutter and stammer, while plush synthesized chords breath life into future movements. Under an atmosphere of space and exploration Starseed brings the listener into and out of a series of distinctive conditions. The pieces offered by Ascendant, Solaris and Transponder provide the greatest chill factor - while Chronos, Fourth Dimension, Germind, Martin Nonstatic, Motionfield, Omelic, and Subdream charge the hidden activity of our minds with dramatic climaxes, revelatory drops, and dreamy forward motion. With its beat machine energy, the music motors up - fully enjoys its peak, and eventually slows down for a smart gentle landing. Where do these amazing inventions come from? Answering this would take an explanation of the fertile inventive mind. The truth of this substantial journey is to show us, while the world and its heavens are immense, that we are bigger on the inside - that within our hearts and minds there is more... more substance, and more to be discovered.